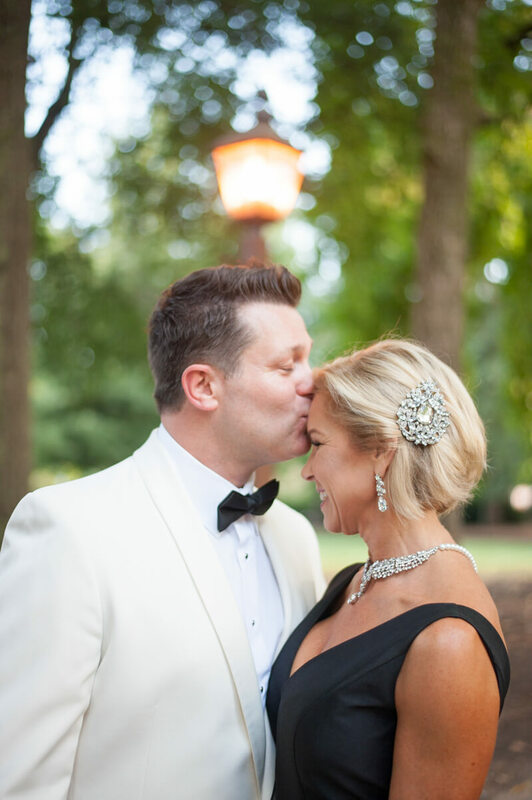 Mordecai Historic Park Wedding - Raleigh, NC. Having both been married once before, Amy and Francis knew they wanted a more relaxed, intimate wedding that truly celebrated their love and their children. There were only 20 people at the wedding, including their newly blended family. Amy's son, Devon, and Francis' daughter, Elle, accompanied by their son together, Sebastian, made up their wedding party. Amy wanted to go a non-traditional route for her second wedding and originally wanted to wear a pastel colored dress. But when she and her mother came across the black dress they knew it was the one! Amy dressed it up with a stunning pearl necklace and beautiful blue shoes. 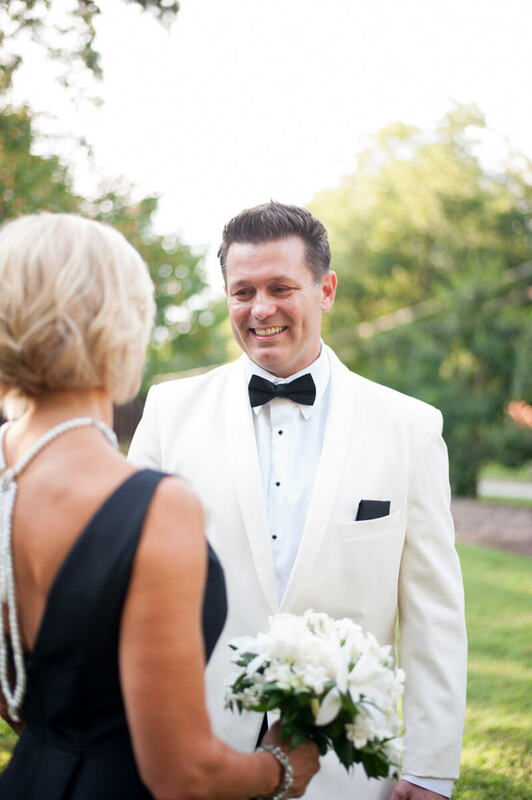 Since she was wearing black, she thought it would look great if Francis wore a white dinner jacket - and she wasn't wrong! The newly-weds looked very dapper in their non-traditional wedding outfits. 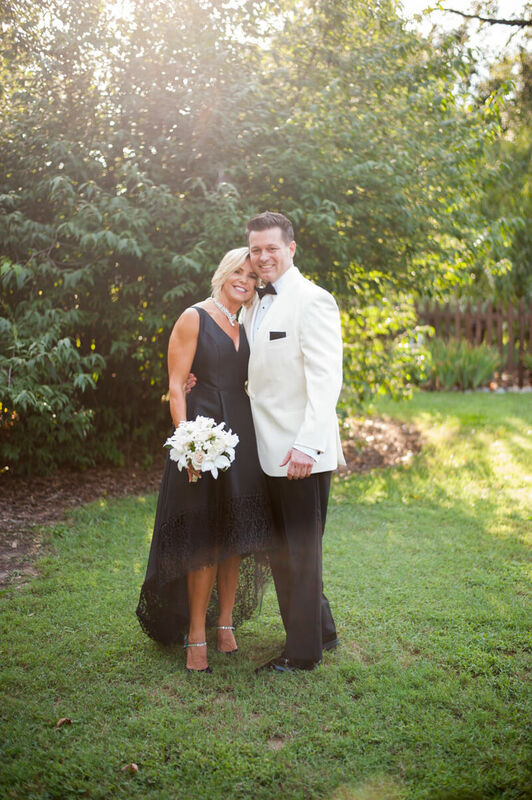 "Since it is both of our second weddings we knew we didn't want anything big. We wanted to keep it simple and elegant. We both love historic homes and live not too far from Historic Mordecai Park. After visiting the chapel, we never looked anyplace else... this was exactly what we had imagined!" "Since it was such a small venue that already had so much character we did not want to take away from the character of the chapel, we did minimal florals from A Fresh Affair in Raleigh. Wanting to keep the natural earthy feel of the chapel we chose beautiful magnolia leaf wraps for the two columns in the chapel and a gorgeous pink orchid floral arrangement for the table at the front of the chapel. We incorporated the pink orchids into both Elle's bouquet and Devon's boutonnieres. My bouquet was all white and so elegant, we incorporated one of the flowers into both Francis' and Sebastian's boutonnieres." "We were looking forward to an intimate ceremony as the sun was setting in the tiny little chapel with our three kids and our family watching. We were also excited about going back to where it all began (Second Empire) to celebrate our marriage with all of our family. To top the night off we had a horse and carriage pick us up at Second Empire to whisk us away into the most perfect night ever!" Advice from the bride, "Definitely keep it simple and don't get caught up in making sure everything is perfect. It will all fall into place and the fact that you are there with the love of your life and your family and friends THAT'S all that matters!"